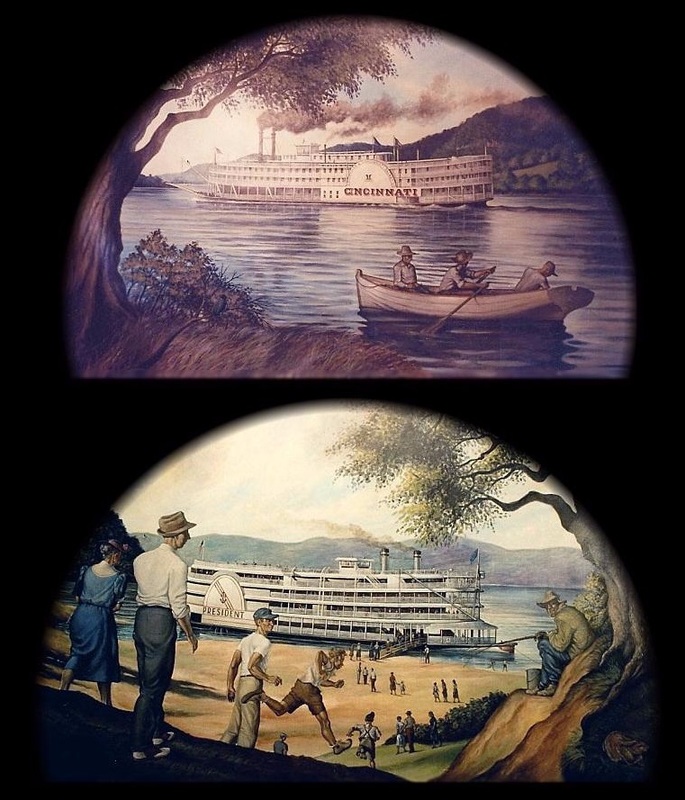 3 steamboat themed murals by artist and steamboat pilot LEXIE PALMORE! To find more artwork and information at this site: Lexie Palmore at Steamboats.com. Do not panic - this is not a mural! It's an illustration of the tragic end to the MITTIE STEVENS. 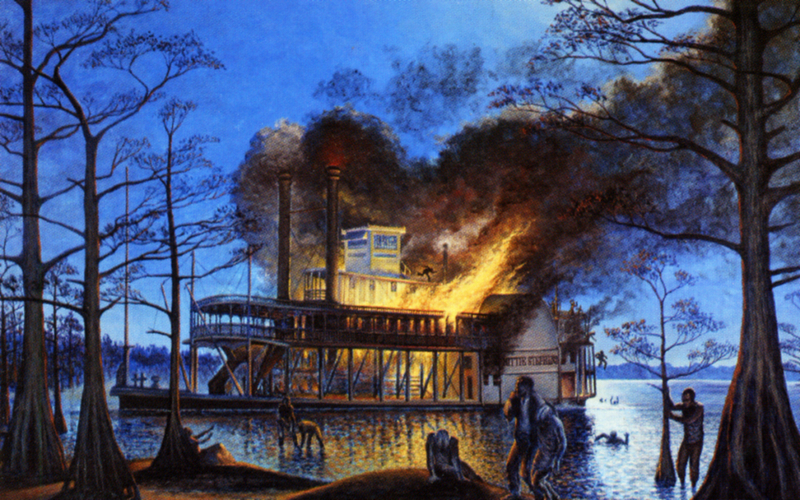 The sidewheel steamboat was destroyed by fire on Caddo Lake in East Texas in 1869. Painting by Lexie Palmore McMillan. This painting appeared on the back cover of SETTLERS OF THE WESTERN WOODS by Steve Hartz. The book includes a CD of recorded Oldtime Fiddle music performed by Steve Hartz and friends. I took these photos of murals at the Arabia museum when I visited during the 1990's. 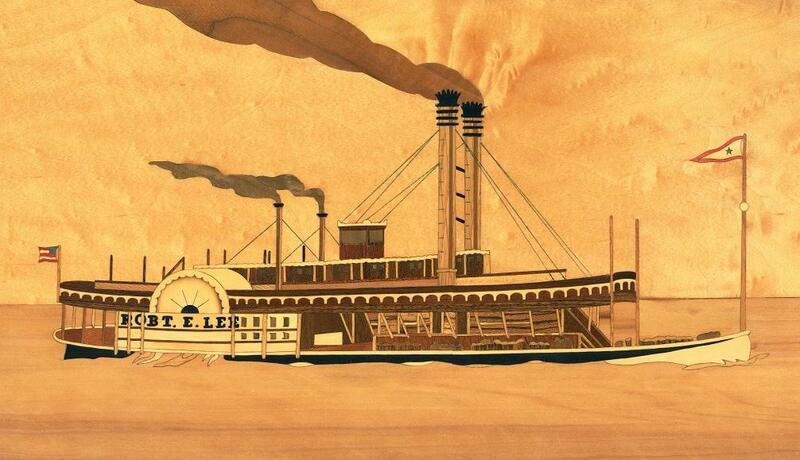 The steamboat Arabia sank in the Missouri River near Kansas City on September 5, 1856, carrying 200 tons of cargo. Lost for 132 years, she was unearthed in 1988. Well preserved clothes, tools, guns, dishware have been salvaged and are on display along with the engines and other remains of the boat itself at the Arabia Museum in Kansas City. Their website is 1856.com. 1914 Anheuser-Busch also produced a serving tray which Berninghaus himself apparently refined and smoothed downfrom it's appearance in the panoramic lithograph, brightening the colors and extending the sky to fill the tray's rectangular format. 1914 Anheuser-Busch also produced a serving tray which Berninghaus himself apparently refined and smoothed down from it's appearance in the panoramic lithograph, brightening the colors and extending the sky to fill the tray's rectangular format. I thought I would pass on my knowledge of this tray, as I am a collector. The artwork is copyrighted 1914, but the tray was produced post prohibition in the 1930's. Also the original artwork did not carry as many AB logos, they were added later. I know because I have a copy of the original 1914 AB booklet "Epoch Marking Events of American History". In 1914, a year after his wife died of diabetes, the Anheuser-Busch Brewing Company release a promotional booklet titled Epoch Marking Events of American History that was composed of billboard illustrations that Berninghaus had previously completed for the company. The book included 10 paintings by the artist featuring historical events important to the American West, including Hernando de Soto's founding the Mississippi River, Jacques Marquette's descending the same river, Pierre Laclède's founding of St. Louis, a scene from the Lewis and Clark Expedition, John C. Frémont, a pioneer wagon train on the Salt Lake Trail, and a Union Pacific train. Berninghaus painted a number of paintings for the Busch family throughout his lifetime, many of which were donated to the St. Louis Art Museum. Just an FYI, I enjoyed perusing your site. Editor's Note: Thank you John for this information! William E. L. Bunn (1910-2009) was a designer, muralist, and painter in Ft. Madison, Iowa and Ojai, California. Bunn was born in Muscatine, Iowa and received his B.A. in Graphic and Plastic Arts and an M.A. in Theater Design, both from the University of Iowa. In 1937 he was awarded a one-year post-graduate fellowship as an art intern for Grant Wood. From 1938 to 1942 he won four commissions from the Treasury Department to produce murals for Federal buildings. 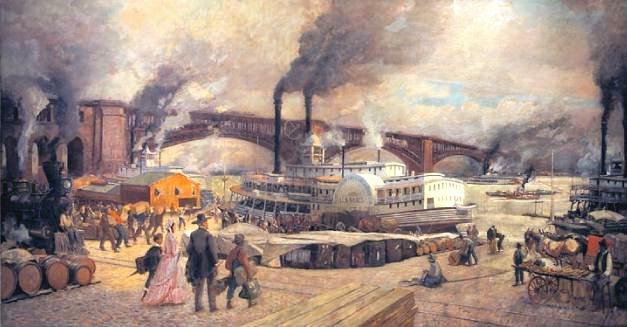 He also exhibited paintings, primarily depicting Mississippi River steamboats, at the National Academy of Design, Art Institute of Chicago, Pennsylvania Academy of Fine Arts, and other group shows. Beginning in 1943 Bunn worked as an industrial designer at several companies including Sheaffer Pen Company (1946-1967) and Cuckler Steele Span Company (1967-1977). After his retirement, he and his wife, Annavene, moved to California, and he continued to paint. Bunn was also active in the Theosophical Society and had an interest in aviation. 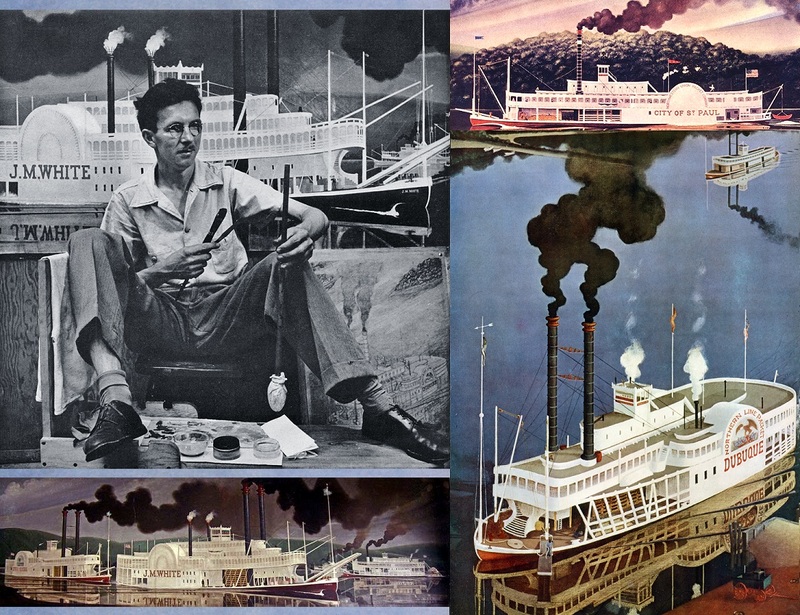 LIFE magazine featured two photos of William Bunn (one is included above) and his majestic steamboat paintings the October 14, 1940 issue. Below is the text from that "Art" feature. The mural entitled MISSISSIPPI PACKETS was a work in progress (J.M. WHITE at center) behind Bunn at his studio in Iowa City, Iowa in the photograph and it was installed in 1940 in the U.S. post office in Hickman, Kentucky. The completed work is in the lower left. 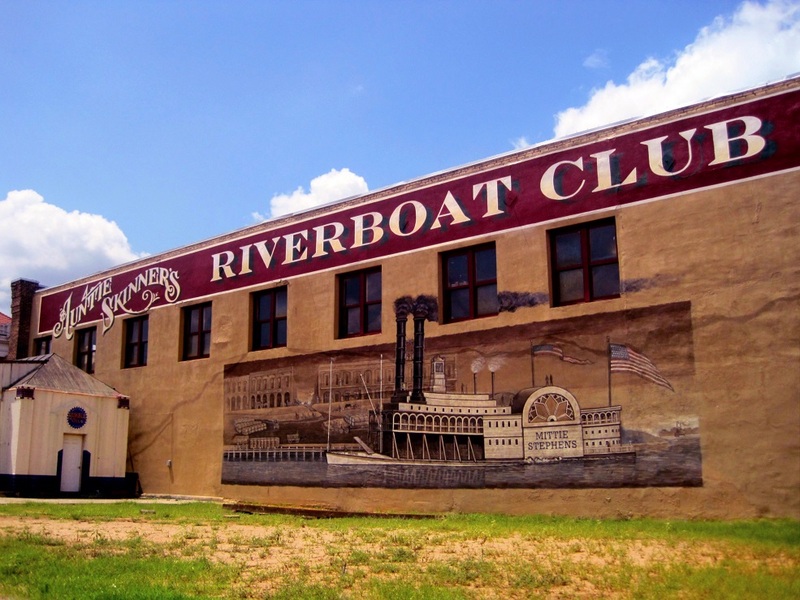 A mural of a head-on view of the steamboat DUBUQUE painted in 1936 is in the U.S. post office at Dubuque, Iowa. In the LIFE issue there are three color images of Bunn's paintings, two of those are presented on the right. A "study" drawing of the high angle view of the DUBUQUE (in color on the right) can be seen behind Bill's left leg in the photo. "When I was a youngster," says Painter William Bunn who grew up in Muscatine, Iowa, "my buddies and I always headed for the river after school. We would row across to the Illinois shore or out to Towhead Island where Mark Twain used to play as a boy. We absorbed all the sights and smells and sounds of the Mississippi it was the one great dominating influence of my life." 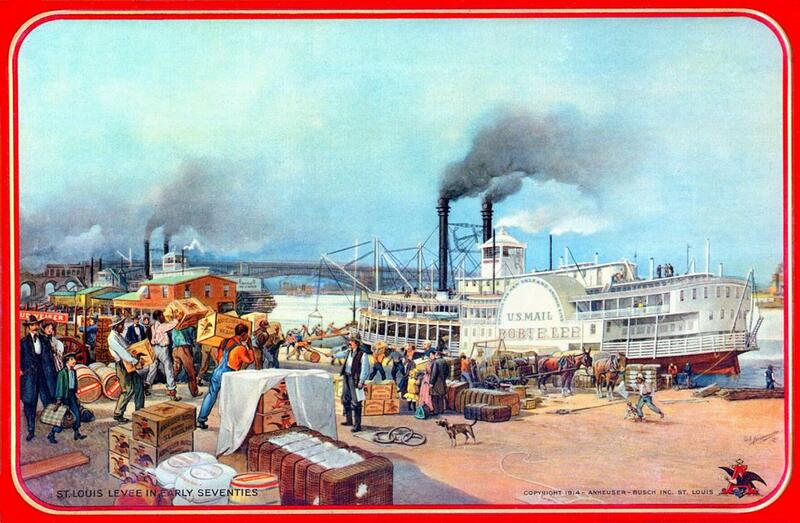 This river influence had made Bill Bunn at 30 a specialist in painting old time Mississippi steamboats. His murals are to be installed in Iowa and Kentucky, and next year he will hold his first one-man show in New York City. Bunn's boats evoke a vanished era in American life when the great floating palaces set a standard for elegance. They served the finest Southern cooking. At night as the dark shores slipped by, their decks were aglow with lanterns and passengers danced to banjos. In the sunlight they glistened like wedding cakes with their gilded gingerbread. Almost every trip brought adventure. There were gamblers aboard. Courtships flourished in the long lazy days. Rich planters, who were given free trips as a bonus for their shipments, sometimes took their wives, sometimes did not. Once in a while one of the boats exploded and burst into flame. At the end of the run, gay as a foreign capital, was New Orleans. With a historian's zeal, Bill Bunn reconstructs his steamboats from old drawings and photographs or from boat-builders' original plans. He paints them in a clean, ship-shape style that shows his five years of study with Grant Wood in Iowa City. This month Bunn and his 19-year-old wife will sail their own boat from Lake Itasca, where the Mississippi begins, 2,500 miles down to New Orleans. If they run out of money, Bunn says he will do portrait sketches on the way or set up his portable Punch and Judy show and perform for youngsters along the river front. 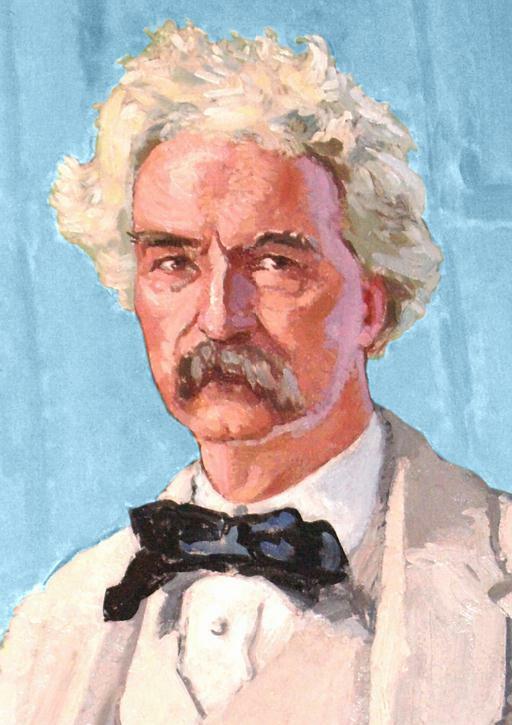 Detail of the Mark Twain mural in the Missouri Governor's office. Cape Girardeau as it was appeared in the mural METROPOLIS in 1940, was created as part of a WPA project. Today, some of the buildings are missing, but very many of these structures still exist. Of course the river port is no longer filled with so many boats and so much activity. The train depot (red brick in the center) is gone, as well as the factory building in the far right. The old St. Francis Hospital in the far left at top is gone, as is the old bridge, which was pretty new at the time of the painting. But the Court of Common Pleas, top and center is still there, as is the building to its right, the Southeast Missourian Building. Going right from there, the Marquette Hotel (just to the left of the smoke stack smoke) is still there, and just above, the domed Academic Hall at Southeast Missouri has recently been renovated. Coming down the hill from the old Marquette Hotel, the Presbyterian and Lutheran church buildings are still there. To the left of the old train depot are the B'Nai El Temple and St. Vincent's Cathedral, both of which are still shining. In 2004 Ed Garbert (1928-2015) and I used our computers to create this panoramic re-creation of how we speculated Hannibal, Missouri probably looked in July of 1848 based on drawings made by English artist Henry Lewis (1819-1904) when he traveled down the Mississippi River from St. Paul to New Orleans sketching rivertowns and cities. Returning to England Lewis used his own sketches as reference to paint with the help of assistants, a huge touring panorama of the Mississippi River that he presented as a narrated traveling show in European cities. The long canvas was 12-feet-high by 1,250 yards long that was exhibited by cranking the "panorama" from left to right between vertical rollers and was lit by the stage footlights of the time. Lewis also made 80 individual color lithographs of selected rivertowns, cities and scenic landmarks that were published first in an 1854 German edition entitled VALLEY OF THE MISSISSIPPI ILLUSTRATED and later in an English edition. Steve Railton at the University of Virginia has included our panorama in the portion of his Mark Twain site devoted to Sam Clemens, Hannibal, MO and how Mark Twain's memories of the town and the Mississippi provided the inspiration for the adventures of Tom Sawyer, Huckleberry Finn, Pudd'nhead Wilson as well as anecdotes that he included in his correspondence, his travel books and his autobiographical writings. "The panorama was done in the style of a post office mural from the Depression-era WPA. The white building above the steamboat paddle box represents the office of Justice of the Peace J. M. Clemens (Sam's father). The Clemens family lived one block further back from the river. "Using the 1854 map of Hart and Mapother as well as Ruger's 1869 bird's eye view I determined as closely as possible the materials the depicted buildings were made of, brick predominating with the white and gray buildings constructed from wood. The buildings on the far left are the pork slaughtering and packing business. The building on the far right I believe was a sawmill. Other pork packing businesses and a tobacco factory most likely occupied the neighboring buildings on the far right. The other brick structures would have been occupied by hostelries, merchants and tradesmen, warehouse facilities, & Co. As a foreground focal point I added the steamboat "Missouri" (aka the "Big Missouri"), which operated on the Mississippi from 1845-1851. The "Big Missouri" is the boat Ben Rogers "personates" in Chapter 2 of Tom Sawyer. "The image was colorized with the help of my friend Ed Garbert. We put the light source in the east, as the village would appear in the morning (and since the town is laid out at a northwest to southeast angle parallel to the river, this is how the buildings are lit to best advantage). Ed 'painted' the majority of the buildings with a Photoshop program and I modified the foliage, added the steamboat and modified the color scheme. "The National Geographic article 'The Mighty Mississippi' (1971) reproduces the two pages from Lewis' sketchbook on which this picture is based. My original black and white rendering of this scene was featured on the cover and fly leaves of Hannibal Too, by Hurley and Roberta Hagood (1986)." 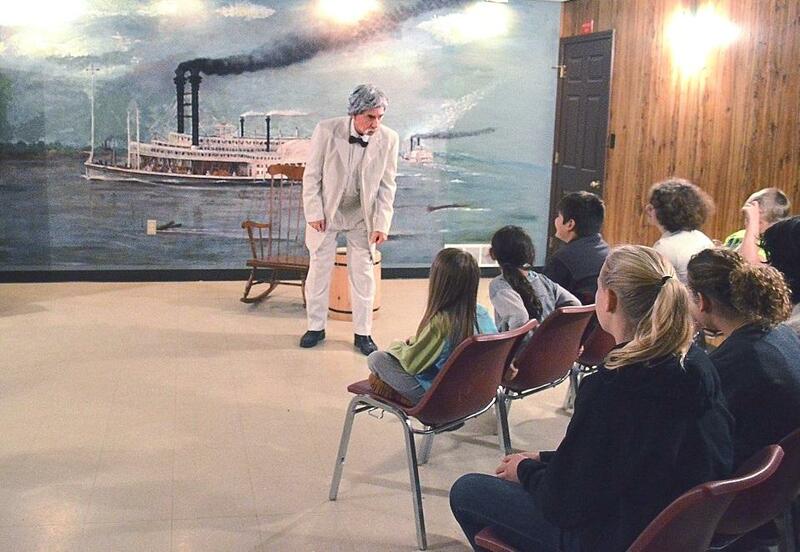 Jim Waddell giving his orientation talk to school kids who were bussed over to Mark Twain Cave for a Tour. The mural behind him is an enlargement of a super high resolution Library of Congress file of a steamboat painting (seen above, by August Norieri) that lends itself well to the environment of this room where the tourists of all ages get an introductory talk prior to going on the tour of the Cave. For more Jim Waddell, click here. Looks like a lot of man hours went into this 13 3/4 X 22 inch wood Marquetry Inlay plaque of the steamer ROB'T E. LEE signed by "VERN - 1983." Yay, Vern!